When spring and summer roll around you always just want to be outside! What better way to soak up the sun and celebrate the summer holidays than with a picnic! This picnic blanket will be the perfect way to bask in the glory of summer! 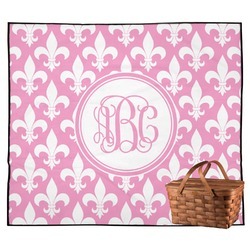 This picnic blanket is perfect for hanging out with your friends at the park or anywhere outside. The top of the blanket is made of a super soft microfiber fleece. The bottom of the blanket is made of a black material similar to a rain jacket and is water repellent as well. This will keep any wet spots on the ground from soaking through your picnic blanket. No one likes a wet blanket. The blanket measures at approximately 50" x 59" and has a nicely finished ribbon edge. Create the perfect design for your picnic blanket. Create a special design for your family reunion, a fun summer design, or just a design that is specific to your personality. Choose from thousands of patterns and backgrounds to start yourself off right. If you ever need any help designing, we are always happy to chat with you. Don't stop there! Get everything you need for spring and summer fun! Beach towels, flip flops, beach spiker cup holders, and ice buckets are just a few of the things you can grab to make your outside fun more pleasurable. Check out our Outdoor section to find anything else you may need.